America's Favorite Scenic Drive offers overlooks, trails, picnic and camping areas for those traveling by car, motorcycle or bicycle. Begins near Waynesboro, Virginia and Ends near Cherokee, North Carolina. 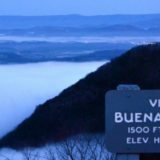 There are three access points in Rockbridge County. Northern Rockbridge: U.S. Route 56 Buena Vista: U.S. Route 60 Southern Rockbridge: U.S. Route 130 Free! Certain sections may be closed during inclement weather.